I go to a fabulous weekly writing class. Recently, a homework assignment was to write about a memory associated with a soul food: a food that reminded us of home or of our youth (for better or worse). It made me wonder if a nation can have a soul food too, or if that’s the exclusive domain of individuals. If there is such a thing, what’s America’s? If you ask children here what their favourite food is (and, let’s face it, they’re at the age where they’re determining their future nostalgic soul food), they’ll often say mac ‘n’ cheese (that’s macaroni cheese to the uninitiated). Come to think of it, I’ve heard several adults talk longingly of mac ‘n’ cheese too. It would never feature on Max’s meal requests, given that it contains, uh, cheese, and it seems pretty pointless to me too; it is, after all, just pasta and cheese. But the point about a soul food is that there is no point. It’s a “go to” comfort food, a food that swings the focus of our attention directly to the emotions associated with that food, to the safety and security that it offered, or the love that came with it. It’s not about the food at all. It’s possibly easy to see what America’s soul food is because I don’t have any subjective experience of it, but I wonder what would constitute Britain’s. Bangers, beans and mash? A Sunday roast? Or curry? America’s soul food doesn’t even need to be homemade. 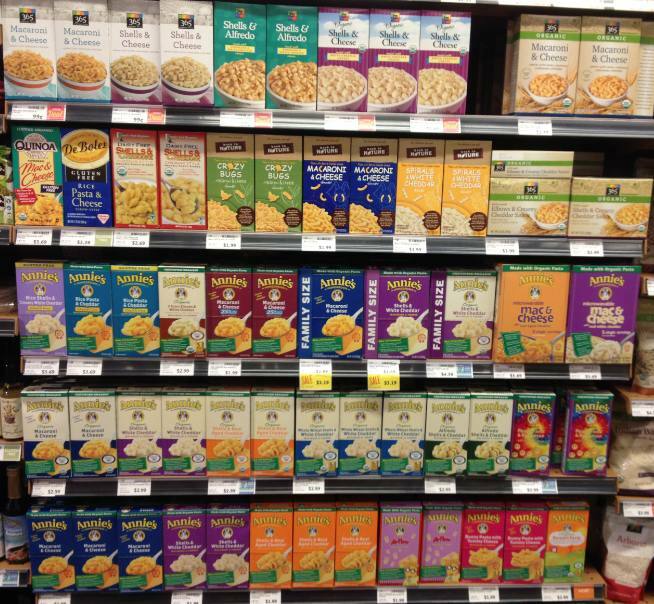 Check out the vast number of ways you can buy ready-made mac ‘n’ cheese.